Do you gain weight no matter what you eat or how much you exercise? Do you have a hard time thinking clearly or remembering things? Are you tired, weak or depressed? You may have an underactive thyroid gland. An underactive thyroid means your body is not making enough hormones to keep your metabolism functioning optimally. Your thyroid hormones play the most important role in your metabolism — how your body uses the food you eat and converts it into energy. Even small changes to thyroid function can cause weight gain and other troubling symptoms. You’re more likely to get hypothyroidism if the condition runs in your family. Women are more likely than men to have hypothyroidism, especially as we age. This is why many women experience weight gain as they enter midlife. Even younger women whose thyroid test results are normal may have enough of a reduction in thyroid function to cause unexpected weight gain. Hypothyroidism upsets the normal chemical balances in your body, and the symptoms usually develop slowly over time. It’s easy to mistake the symptoms for normal signs of aging. However, an underactive thyroid can lead to numerous health problems including obesity, joint pain, infertility and heart disease. Unexpected weight gain, and difficulty losing weight, is often the first sign of thyroid trouble. The weight gain can happen quickly or over several years. Gaining a few pounds each year despite a healthy diet and regular exercise is common for those who suffer from hypothyroidism. Reduced thyroid function can result from a sluggish thyroid gland or your body having difficulty using or converting thyroid hormones. Either way, the problem causes your metabolism to slow down. Women are especially prone to thyroid and weight issues because the thyroid is linked to other systems that affect weight such as, your adrenal glands, neurotransmitters and reproductive hormones. For example, you’re more likely to develop thyroid problems during pregnancy, perimenopause and menopause, if you experience premenstrual syndrome (PMS) or chronic stress. Doctors often prescribe hormone replacement medication to treat endocrine imbalances, including hypothyroidism. The standard treatment involves synthetic thyroid hormones to restore hormone levels and eliminate symptoms. Synthetic hormones do not work well for everyone so natural hormone derived from pig thyroid is a superior alternative, which is also available by prescription. Some people require a holistic approach, one that looks at your thyroid health in relation to your overall hormone balance. Proper nutrition and supplementation are effective ways to support your thyroid, but consistency is the key. Yo-yo dieting slows your metabolism and stresses your system, which usually leads to more weight gain. Whole foods and high-quality supplements can provide the optimal nutrition for your thyroid gland. Look for foods that contain iodine and selenium. Zinc, iron and copper are also needed for your thyroid to function optimally. Skipping meals can stress your body and your thyroid, so eat at regular times throughout the day. Include protein and green vegetables with every meal, and avoid eating too much grain. Alcohol, gluten and refined sugar can interfere with thyroid function, so eliminate them from your diet. Cruciferous foods like broccoli, cabbage and cauliflower contain thyroid-suppressing compounds called goitrogens. Always cook or steam these vegetables to reduce their goitrogenic affects. 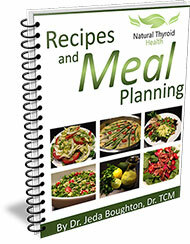 Good nutrition is critical for healthy thyroid function and overall health. Symptoms are the way your body communicates that it needs help. If you’re experiencing weight gain, low energy and other symptoms of hypothyroidism, listen to your body and take action by finding help from a doctor experienced in treating thyroid disorders naturally.